6 things I learned white water rafting on the Colorado River. 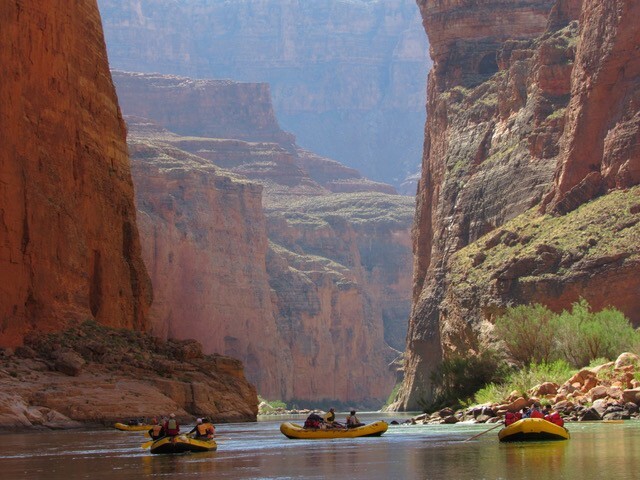 The Grand Canyon has long been on my bucket list so, when Chuck Fleischman invited the cohorts from the ALI program to join him on a white water rafting trip down the Colorado River it took me no time to sign up! There was a purpose to this trip beyond a check mark on my bucket list. Chuck and I are both conservationists. He and the Friends of the Grand Canyon Foundation, as well as many other environmentalists including Robert Redford, believe the area known as the Confluence to be sacred ground that should be preserved. They have been trying to fight a development project that would include building a tram to take people from the top of the Grand Canyon to the Confluence, where the little Colorado River meets the big Colorado River. Chuck wanted us to see where the proposed development would be located so we could better understand what is happening and help support his conservation efforts. After seven days of paddling in sturdy boats from Marble Canyon to Phantom Ranch and feeling like I was in the womb of the earth, I understood why the Grand Canyon is considered one the single most impressive geological sites and one of the seven wonders of the natural world. I also learned a lot on this trip. Here’s what I’d like to share. There’s a reason the Grand Canyon limits the number of visitors to the river. It took two years from the time Chuck first suggested this trip until it happened. Reservations are limited and because they’re hard to come by they must be done well in advance. Within five minutes I understood why. The Colorado River Management has a vision to “provide a wilderness river experience in which visitors can intimately relate to the majesty of the Grand Canyon and its natural and culture resources.” It’s a vision that I can attest they fulfill. We have John Wesley Powell to thank. Robby Pitagora and his amazing guides from Rivers and Oceans not only expertly piloted us, they fed us terrific food and told us endless stories of John Wesley Powell, the explorer who is credited with leading the first group of white men down the Colorado River and through the Grand Canyon in 1869, a trip that would impact all future westward expansion. A Civil War hero who had lost his right arm in the Battle of Shiloh, Powell set out to prove his theory that the river preceded the Canyons and then cut into them as the plateau rose. That first expedition started with ten men in four boats, covering 1000 miles and would end with just five of them! Life is measured by minutes. I had so many aha moments on this trip. One of them was when my boat mate and dear friend David Moody said “life is measured by minutes.” Those words took on new meaning as we drifted down the river, surrounded by the Canyon walls estimated to be 5 million to 1.8 billion years old! I emerged from the depth of the canyon with the renewed commitment to appreciate every minute of every day of my life. It’s good not to have WIFI. While many had trouble letting go of their smartphones, I was not one of them. I can go from a hundred to zero in five minutes when in nature so it was easy for me to get into the peacefulness of the flow of the river and slow down. In many ways it was like time traveling to my youth and my summer canoe trips when we weren’t as distracted with technology and when live conversation and human interaction were how we entertained ourselves. The Grand Canyon Escalade Bill puts the Confluence in danger. A group of international investors have proposed a plan to build a multi-million dollar tourist site that includes a restaurant perched alongside what are now the pristine banks of the Colorado River. While this would expose thousands of new people to the experience of the Grand Canyon many, including my friend Chuck believe the impact on the environment would be irreparable. The Navajo Nation who must approve this bill is divided on this issue of environment and economic progress and at this time there are not enough votes to pass it. Our national parks are treasures. All you need to do is set foot in one of our fifty-nine magnificent parks and soak up their beauty to be reminded of what jewels they are. Yet like the Confluence they are in danger of being commercialized. Whether it’s because of development projects like the Grand Escalade Bill or executive orders making it easier to drill for oil on park lands, our national parks are at risk which is why I invite you to visit one this summer. I guarantee you experiencing one of our national treasures first hand will leave you as it has me — empowered and inspired to help preserve our parks and to always live each and every day with a green heart. For more information, visit Save the Confluence and the National Park Service.